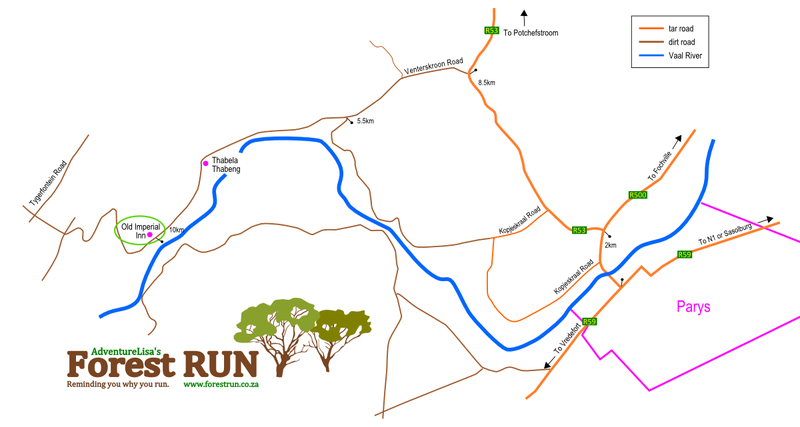 Forest Run is held in the Vredefort Dome, outside of Parys. Although Parys is in the Free State Province, on the Vaal River, the Vredefort Dome is the other side of the river in North-West Province. The race starts from the Venterskroon Inn (they changed their name from Old Imperial Inn in late March 2016) in Venterskroon, a historic mining town located about 30 minutes from Parys. Parys is less than 90-minutes from Jo’burg. The event is held in late-May and it could be cold. Certainly, the morning will be chilly but the day should be mild – perfect running conditions. Rain – and thus thunderstorms – should be unlikely. We’ll keep an eye on the weather forecast closer to the time. There is excellent road access from all over the place and recommended routes all depend where you’re coming from. The roads from Jo’burg – whether N1 or R59, are all very good. I put in ‘Parktown to Venterskroon‘ on Google Maps – a good route that doesn’t pass through Parys. 127km in 1h26. An alternative to this Google Maps route is to stay on the N1 until the R59 Parys off ramps. Head for Parys and pass through the town. Note the funny ‘kink’ in the R59 when you get into the town. In town, the R59 does odd things. At the stop street, turn right to stay on the R59. The road bends to the left, keep going. At the second traffic light (Car dealer on your top right), turn right (the sign says Potchefstroom R500 (R53). Cross the bridge over the Vaal River. 2km from town, turn LEFT on to the Potchefstroom (R53) road. After 8.5km, turn LEFT on to the Venterskroon Road (look for the Venterskroon Inn and Berakah 4×4 signs). This is a dirt road. Its condition varies and is currently quite corrugated with some relatively clear sections. If you’re uncertain how to get to the start, please use this map, Google Maps or your GPS (but check first that your GPS has the correct place – don’t blindly trust it!!!). Click to view a full size map.